Natalia Read is a GP in South East London. 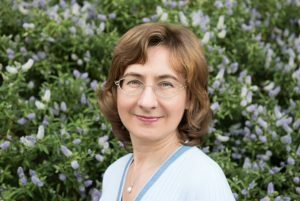 Natalia is originally from Russia and has nearly 30 years’ experience in paediatrics, A&E, obstetrics and gynaecology, and general practice. She has been working as a GP in the UK since 2000. Natalia developed her interest in yoga about 6 years ago, and it was not until she did Heather Mason’s 8-week Yoga for the Mind Course that she felt real physical and psychological benefits personally. For Natalia, as a doctor, the whole idea of bringing together physical yoga practices, pranayama and mindfulness, based on the neuro-scientific, anatomical and physiological understanding of these practices, and having confirmation that these practices were evidence-based was exactly what she needed. Natalia has now completed 500 hours training in yoga therapy. She sees yoga therapy very much as a positive and beneficial adjunct to General Practice. She also does clinical lectures for Minded.